REDDING, Calif. — An explosive wildfire that closed down dozens of miles of a major California freeway nearly tripled in size overnight, just weeks after a nearby blaze that left neighborhoods in ruins and killed eight people, officials said Sept. 6. The fire that erupted the afternoon of Sept. 5 and devoured timber and brush on both sides of Interstate 5 near the Oregon state line had expanded to 23 square miles Sept. 6, prompting mandatory evacuations, the U.S. Forest Service said in a statement. That’s up from 8 square miles burning Sept. 5. 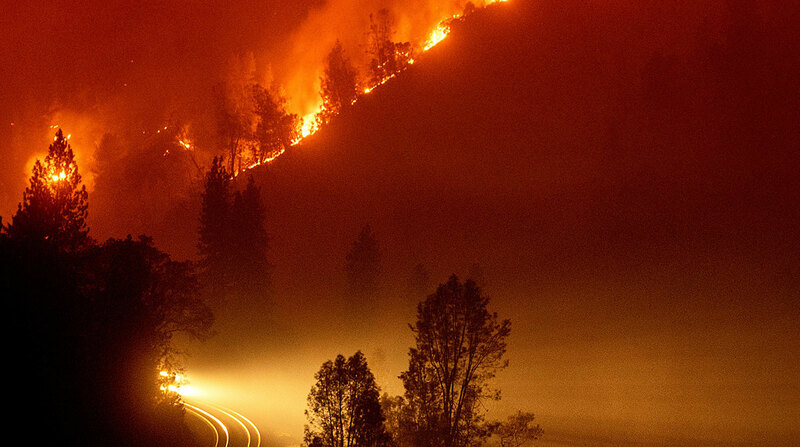 Truckers abandoned their vehicles Sept. 5 as flames roared up hillsides. In a video, a passenger in a vehicle screams: “Oh my God, I want to go!” as trees burst into flames and sheets of fire roiled on the side of the roadway. About 17 big rigs were abandoned and at least four caught fire, Lt. Cmdr. Kyle Foster of California Highway Patrol’s Mount Shasta office told the Los Angeles Times. About 45 miles of I-5 were closed in both directions, said Chris Losi, a spokesman for Shasta-Trinity National Forest. The road remained closed through the night of Sept. 5, and there was no immediate word on when the lanes would reopen. The blaze also delayed Amtrak’s Coast Starlight train service between Sacramento and Oregon. Rural homes and cabins in and around the forest were under evacuation orders, from the community Lakehead north to the Siskiyou County line, Losi said. The fire was showing “critical” behavior — burning fiercely and moving rapidly — but still was far from large towns, he added. The city of Dunsmuir, with about 1,500 people, was about 15 miles from the fire. Residents were issued an evacuation warning, urging them to be prepared to leave.